Mostly cloudy. Late day rain and snow on Cape Cod, evening snow expands northward. Highs in the 30s. Overnight Monday: Light snow in eastern New England. Lows in the 20s. An intensifying coastal storm will brush by New England early this week, bringing gusty winds and some snow to the area. As that happens today, highs will mainly be in the 30s, except just a bit colder far north and a bit warmer far south. Skies will be mainly cloudy, and there will be a stray rain or snow showers during the afternoon as the storm nears. 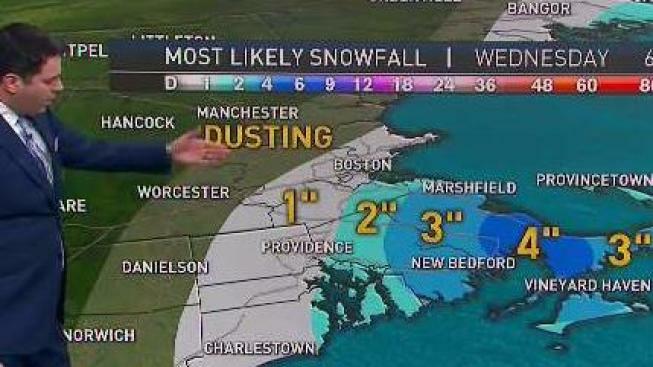 The best chance for that would be in Southeastern Massachusetts. Snow will be most widespread late Monday night into early Tuesday, especially for the South Shore, Cape, and Islands. North and west of there, the snow will be fairly minimal. Expect 1-3 inches in those areas south and east of Boston, with a few localized amounts higher than that. Other areas just pick up 0-1 inch. The continued gusty northeast wind on Tuesday morning will also pair up with astronomically high tides to create areas of splash over or minor coastal flooding. The storm pulls away and sunshine returns on Wednesday, just in time for a partial lunar eclipse. That takes place just before 7 a.m. on Wednesday in New England. Remember a lunar eclipse happens when the moon passes through earth’s shadow. Another disturbance will likely bring some rain or snow to the area by the end of the work-week.